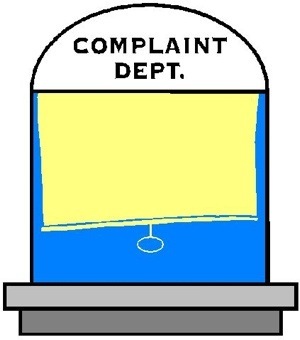 I wanted to share my very real and personal experience of a customer complaint. You’re wondering why I would share a customer complaint for my small business, that could be suicide. But it’s not. No small business, nor large one is perfect. It’s what you do to handle and understand your customer, the consumer and make it right. So we do these amazing toddler dresses and I’m very proud of the product I produce and the handmade high quality product I produce. We had a young lady order a dress. Note, the dress she ordered was a big hit and the size she ordered was not even available without me sewing it that day, which I did. So the order’s placed, let’s say on a Tuesday. Annabella cut it out the same day, I sewed it the same day and was out the door for shipping Wednesday. I’m very proud that we turn this stuff around and unless there is an issue with the fabric, meaning, we sold quite a few in the week and now we are short on the fabric and have to reorder, your product is shipped same day or next! Really proud that my customers always say handmade, quick shipping is a perk. Also, every order I try my best to handwrite a thank you card to each customer. That’s what’s so important to me! I will do that as long as I have a hand to write!!!! But back to my story, or my complaint. Let’s just say that as a designer, a business owner, tough to swallow and hate this. We researched the order and the picture we have, the top of the dress is tough, it does come out a rather more blue than green, but the details we have online says “deep dark green with aqua green polka dots. My response was how sorry we were and how we stand behind out product and stand behind our return policy. I then gave her my personal cell number to call me so we can figure it out. She phoned! I was so happy, I answered immediately. We spoke, she picked a new dress and HoM overnighted it to her along with a per paid envelope to return the dress that she didn’t want. And she was so great in knowing she was speaking with me and how she appreciated out customer service. More importantly, her daughter is turning 2 and will be wearing an HoM dress for her bday party and I’m happy to do that. I will refund her the money and this one is on us. I’ve been there and purchased something off line and it’s not what I thought, and how I knew I couldn’t do anything. But you know what. I will sell that dress somewhere, and I hope that our response and my TLC will go a long way! One can only hope! I want to be a business owner / entrepreneur but I don’t have any money for start up costs and I don’t have credit. My plan is to work for a little bit until I have money to start a business. What’s a good job that will prepare me to become a business owner? If a business owner does not give out pay raises or substantial enough promotion opportunities to any qualified individuals, is he allowed to complain about personnel issues such as lack of training and the high turnover rate he experiences in retail? In your own opinion, do you belive it is responsible for a Business Owner to hire family members and close friends as employees for their business over canidates who are more qualified for a job position. Why or why not? I live in Spokane Washington. Here it seems business owners can and will tell people not to park in their parking lots, even lots that are shared by a large number of businesses. Are the business owners justified? What is the controlling regulation or where can I find it? I am writing an essay for my business law class in which we must interview a business owner. I have a few already, but can anyone help out with some more legal questions to ask? Thanks. * Questions related to law if this wasn’t clear. Owning and running a business takes so much time and energy and it’s very hard to leave work at work, especially in the start-up phase. What are some ways that a new business owner can make sure that they have work-life balance and don’t spend 24 hours a day thinking about (and working on) their business. Someone told me that being a freelancer is also being a business owner. I am in the business of selling my own skills. I just don’t agree. What’s the difference, anyway? I started a small work at home business a few months ago as a part time venture. As of yet I’m not making any money. I was told that as a small business owner that I would have a $3500 tax credit. Is this so? I’m asking this question to find the best solution to handling customer complaints. Customers complaint we increase price during the Chinese New Year period. However, we need to pay double then can find local labor to work for us. some more, that is pay to part-timer and no full time local want to work. Will I be required to sell the product over the phone or just attend to customers complaints and inquires? I applied at ADT so I just wanted to know what I’m getting myself into.